First in the Reference 7 Series, its equipped with high-res playback expertise accumulated through years of developing high-end and pro audio equipment. 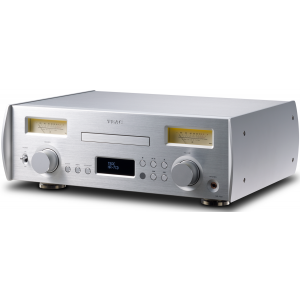 TEAC NR-7CD Network CD Player Integrated Amplifier is capable of handling high-resolution master audio sources including DSD or classic albums from your CD library as well as online music services. Multifunctional in nature, NR-7CD is a no-compromise device. 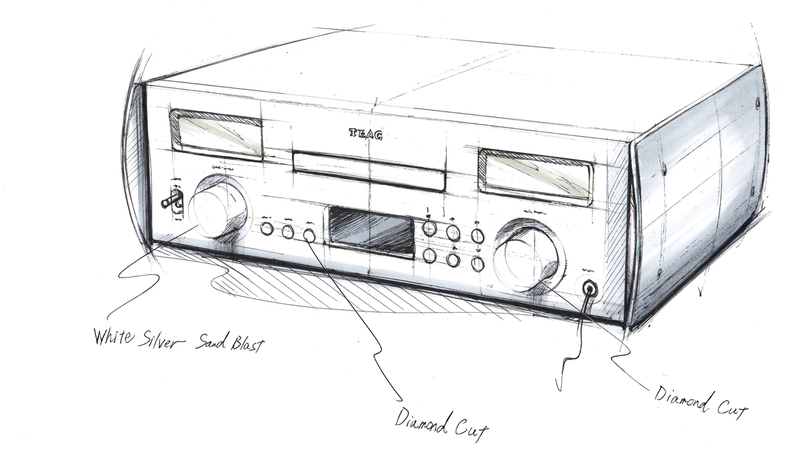 Every stage from DAC to the power amp, uses a ‘dual mono’ configuration, fully-balanced from beginning to end. Highly-experienced craftsmen undertake the entire process from soldering to assembly. With a "Made in Japan" label comes immense attention to detail, as well as a level of sound quality that’s appropriate for the flagship of the Reference Series. The digital, preamp and power amplifier sections each have independent power transformer taps. A dual mode structure has been implemented in the power supply by using a custom EI core transformer with separate left and right windings, especially for the preamp section. High-resolution playback is supported from NAS and high-capacity USB storage devices. As well as 2.8/5.6MHz DSD and 384kHz/32-bit PCM, numerous other formats (DSF, DSDIFF, FLAC, Apple Lossless, WAV, AIFF, MP3, AAC) are supported. In addition, gapless playback is supported for every lossless format, allowing uninterrupted playback of live performances that span multiple tracks. There’s comprehensive support for the TIDAL and Qobuz subscription music streaming services. These enable you to enjoy huge collections of music of high-resolution (or CD-equivalent lossless quality) over a network. You can use the TEAC HR Streamer to select and enjoy tracks seamlessly from their own NAS and USB storage as well as from Tidal/Qobuz’s vast collections in the cloud. In addition to LDAC, which enables high-resolution audio transmission, the NR-7CD’s Bluetooth receiver also supports Qualcomm aptX, AAC and SBC codecs. Using a compatible device, you can easily enjoy wireless high-quality audio listening. LDAC can transfer data at rates about three times greater than existing technologies allowing you to enjoy high-quality sound wirelessly from devices that support LDAC, including high-resolution and CD-quality audio sources. Two optical digital inputs and one coaxial digital input allow you to enjoy high-quality audio from TVs, universal players, portable audio players and other digital sources. Transmission of high-resolution signals is supported and PCM signals up to 192kHz/24-bit and 2.8MHz DSD signals can be input. The audio CD drive mechanism used, designed and manufactured by TEAC, has garnered huge success in many professional CD players. You can easily continue to enjoy your CD collection together with the traditional ease of use. In addition, upconversion with RDOT-NEO interpolates analogous data for frequencies above 20 kHz, which is not recorded on CDs, allowing you to enjoy smooth and rich sound that is closer to the original source. Vintage audio design has been appreciated over the decades because the universal appeal of classic audio components is timeless. Using classic but functional audio equipment as a design guide, TEAC re-interpreted it to take account of modern sensibilities and to sit well in modern living spaces. The side panels, a key visual feature of the Reference Series design, are fabricated from 12mm thick aluminium. These thick panels increase the rigidity and vibration resistance of the chassis. Viewed from the front, the panels have rounded forms that draw gentle arcs in a design that simultaneously evokes a sense of both solidity and elegance. Large peak power meters are located on the front panel. The movement of the meter needles allows you to see and visibly "feel" the dynamics of the music. The meter lighting can be adjusted via a dimmer function and set to three levels of brightness or turned off altogether. The meters emit a warm light, allowing the amplifier's presence to act as an interior lighting accent. Many full-size components are significantly deep, requiring users to consider placement space before installation. Precision-cut aluminium knobs are used for the volume and selector controls. They are attached using high-precision bearings, giving a luxurious feeling to the touch. Even though the NR-7CD is full-size, it occupies approximately the same footprint as a piece of A3 paper, with a depth of just 30 cm, making it relatively easy to locate. This enables placement on shallow shelves, in racks and other convenient locations, while leaving plenty of space for attaching cables to the back. The display uses organic EL technology. Large numerals are used to indicate volume control and are shown on as much of the display area as possible, making them easy to see and allowing comfortable operation even from a distance. The display also shows the sampling frequency of the song being played back. The track number, playback time and other information messages are shown during CD playback. The dimmer function allows the display to be set to three brightness levels or turned off. 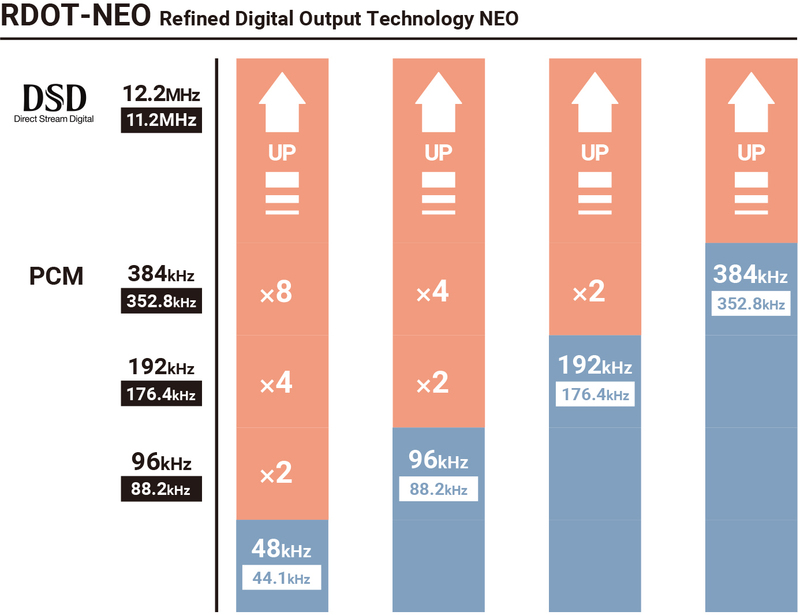 Quality DAC chips are crucial for digital audio. For this dual mono configuration, two VERITA AK4490 DACs have been used for the left and right channels. These DACs are made by Asahi Kasei Microdevices Corporation and have an excellent reputation when used in high-end audio equipment. By keeping channels independent from the DAC section, high channel separation is maintained. In a BTL configuration, one highly-regarded 50ASX2 Class-D stereo power amp made by ICEpower is used in each l channel. This achieves a maximum output of 140 W + 140 W (at 4Ω). With high linearity and high speed, sound is beautifully delivered with power to spare. The FPGA (programmable IC), uses a fluency algorithm that smoothly augments digital audio signals. This enables upconversion of PCM digital signals 2, 4 or even 8 times as well as DSD upconversion. Using this function, you can easily experience the dense airiness of DSD files from your own CD archives. During CD playback, signals are upconverted to the 11.2MHz DSD format, which contains about 256 times more data than standard CD audio. This method is truly outstanding at recreating natural tone and a soundstage that resembles live performance. You can hear the music reverberate naturally and feel the differences in resolution, especially so when instruments overlap. 48kHz PCM audio sources can also be played back at 384kHz PCM or 12.2MHz DSD. RDOT is a technology developed to enable the playback of the frequencies higher than 20kHz that are lost by the 44.1kHz/16-bit CD format. Data above 20kHz is also generated. RDOT-NEO doesn’t just work for PCM upconversion, it also enables conversion to the DSD format. A shunt regulator, also known as an A-class drive, in the power supply stabilises the current of the D/A converter and preamp sections. In addition to suppressing fluctuations in ground potential, it also achieves close tracking of current fluctuations in the circuit. Four types of digital filters are available for PCM signal processing. In addition to two types of FIR digital filters, which have a long established reputation for audio quality, there are also two short delay digital filters that eliminate pre-echo included in impulse waveforms and make the beginnings of sounds seem even more natural. An OFF mode that disables the digital filter can also be used. You can select these as you prefer. These filters have a very well established reputation. They offer a quality that allows reverberation that is both dense and rich while also crisp. The key characteristic of these filters is that there is no pre-echo in their impulse responses and the beginnings of sounds and their reverberations are natural, making the sound close to the original. Individual dedicated 44.1kHz and 48kHz master clocks are built in. The effect of jitter on audio quality is greatly suppressed and the original sound is reproduced faithfully by using audio grade, high-precision crystal oscillators, featuring low phase noise, on input signals with sampling frequencies that are whole number multiples. Interference from the digital section on signals in the analogue section can cause various types of noise. In order to eliminate as much of this as possible, the analogue circuit, after the digital section and the D/A converter, is separated by an isolator and the purity of the analogue signal is maintained by electrical isolation. Support legs arranged at three points enable stable placement of the unit so that it is not affected by slight irregularities in the placement surface. We use an original construction method, with a spike-shaped foot connected to a basin-shaped base. Although pinpoint feet are said to be ideal for audio equipment, they have often been difficult to place. Our design makes placement easy. Supporting the unit on pinpoint feet reduces unwanted vibration, greatly eliminating heaviness and muddiness in low and medium frequencies. This method also improves the resolution and stereo imaging, which contributes to defining individual sounds.